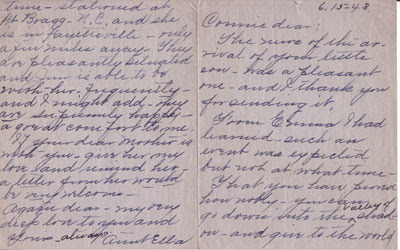 These are two letters from Ella (Gorton) Mackenzie to my mother, Connie (Gates) Markle, 1, shortly after Connie's marriage and 2, after birth of Connie's second son, Bill. Ella (Gorton) MacKenzie Ella calls herself "Aunt" Ella even though she wasn't really an aunt to Connie. She was aunt to Connie's mother--Frances Lenore (Myers) Gates, our grand-mother. Ella was Mary Augusta Gorton's (our great grandmother) younger sister, younger by 11 years. Ella married Eugene C. MacKenzie and lived in Lima, Ohio with her two Mackenzie children, Kathryn and Jim, growing up together with their Myers cousins, Harry, Bert, Bill, Frances (our grandmother) and Ralph, until the Myers family moved to Hartwell in 1906, when Frances was 19 and Ralph was 14. Since Mary, Frances' mother, had died in 1917, Ella perhaps felt that, as Mary's sister, she should take on the role of mother to Frances, and grandmother to Frances' children. Ella also shows a great closeness to her Holland grandchildren since their mother, Ella's daughter, Kathryn, died in 1931, at age 50. Eugene had died in 1921, age 65, almost 20 years before the first letter. 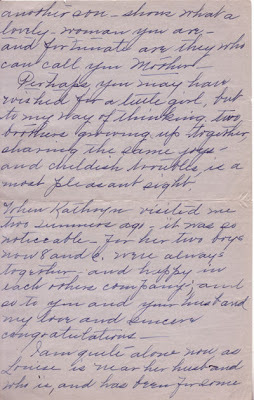 The names in the letter: Kathryn, Fred, Eugene, Laddie (Rolla B. 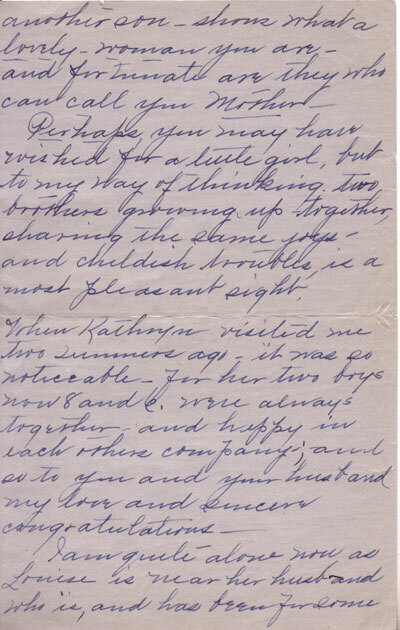 ), and Louise are Kathryn's children, (Ella's grand-children). Kathryn, the younger, had two sons and had moved west. By the second letter, the war has begun, and Louise is married to Jim who is in the army. "Pals." 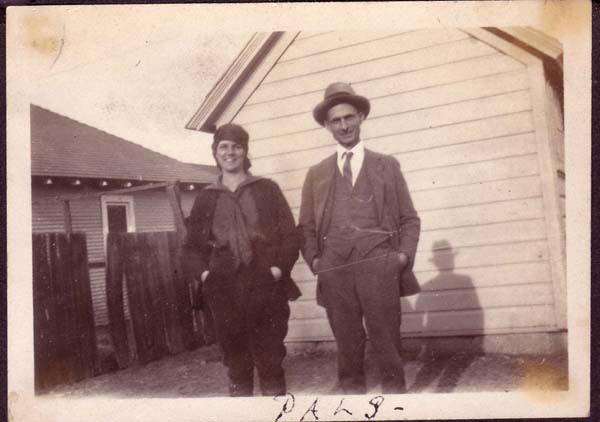 Kathryn Holland, the younger, Ella's grand-daughter, and her father, Rolla B. Holland, an oil man in Iola, Kansas, photo abt 1927. 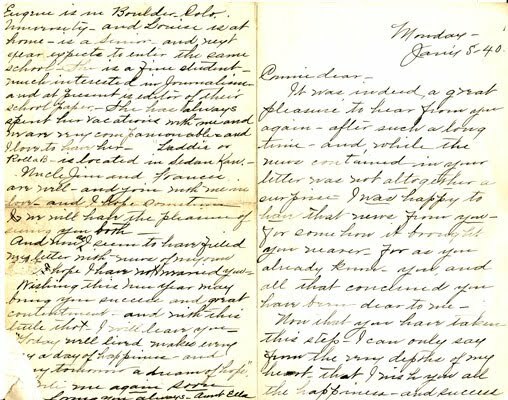 Below the images of the letters is the text. Ella says some quite beautiful things in these letters, and infers much, about marriage, widowhood and the war. 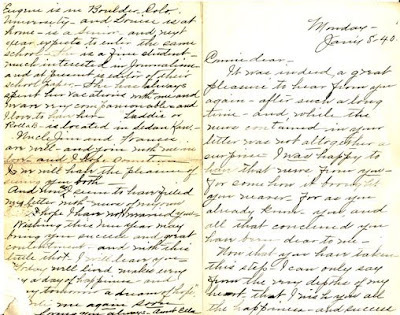 Her family news illustrates the traditional way that letters held a family together. What a wonderful family of artists on the Roberts/Gorton side: painters, writers, poets, and musicians! you nearer, for, as you already know you and all that concurred, you have been dear to me. and so I say God bless you. The handkerchief you enclosed was certainly lovely. And I thank you. blessings that I try not to let my feelings influence or mar others' happiness. for the eight years they have been away. Even Kathryn’s little boys were able to wish me "Merry Christmas"
in their little childish voices, which were so good to hear. They are all well and Kathryn seems to be growing so much like Helen-devoted to her husband and family. Fred lives in Flora, Ill. At present, is doing well and they have a dear little girl about a year and a half old. Eugene is in Boulder, Colo. University and Louise is at home- is a senior and next year expects to enter the same school. She is a fine student- much interested in journalism and at present is editor of their school paper. She has always spent her vacations with me, and we are very companionable and I love to have her. "Laddie" or Rolla B. is located in Sedan, Kan.
Uncle Jim and Frances are well and join with me in love. And I hope sometime we will have the pleasure of seeing you both. 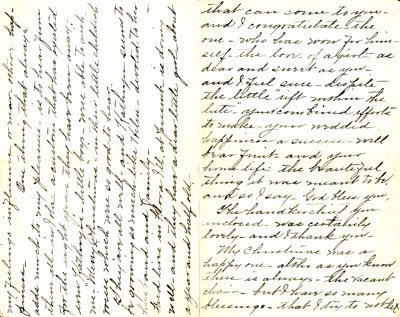 And now, as I seem to have filled my letter with news of my own [life? ], I hope I have not worried you. The news of the arrival of your little son was a pleasant one and I thank you for sending it. From Emma I had learned such an event was expected but not at what time. give to the world another son shows what a lovely woman you are and fortunate are they who can call you Mother. sharing the same joys and childish troubles, is a most pleasant sight. my love and sincere congratulations. stationed at Fort Bragg, N.C. , and she is in Fayetteville, only a few miles away. They are pleasantly situated and Jim is able to be with her frequently. And I might add, they are supremely happy- a great comfort to me. If your dear mother is with you, give her my love and remind her a letter from her would be very welcome.